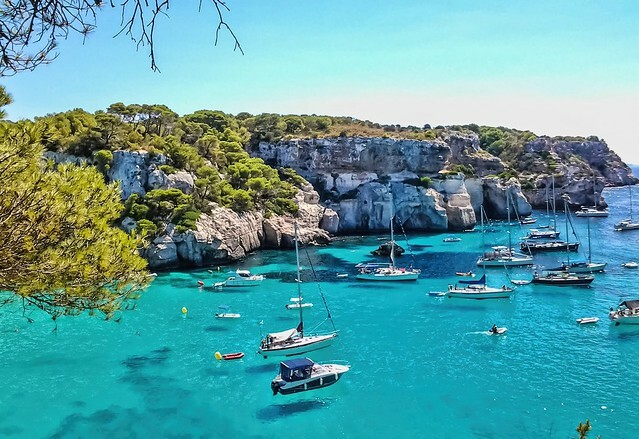 Home » Spain » 13 things to do in Menorca to feel like a Menorquíno! Menorca is one of the four islands that make up the Balearic Islands in the Mediterranean Sea off the coast of mainland Spain. In 1993, UNESCO declared Menorca a Biosphere Reserve to protect the flora and fauna on the island. 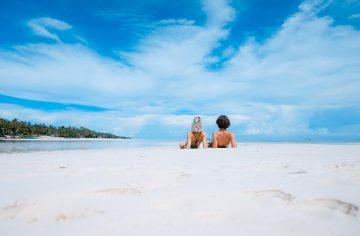 You will see white sand beaches, tall limestone cliffs, and coves that are spread out all through the perimeter of the island. In the cities, you will find white stucco houses in pretty neighborhood lanes. It is sunny for the most part of the year and makes for a great holiday. Temperatures are pleasant throughout the year minus the winter. 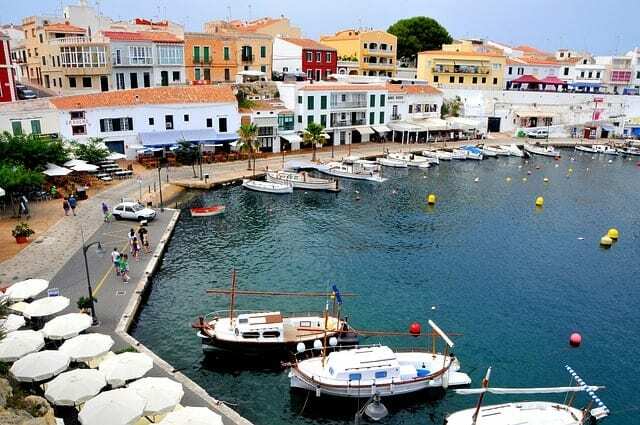 Best time to visit Menorca is spring, summer, and autumn. The temperatures during spring are very pleasant with warm sun and cool breeze, perfect for beach exploration. Starting from March to May should be a good time to enjoy the island before scores of tourists ascend on this island. Summer from late June to early September can be very sunny and hot. A lot of domestic tourists and those from the UK, Germany, and other European nations descend into Menorca. The streets and beaches are full of people. Hence, summer might not be the best time. Autumn is good to visit too. From September to early November when all the tourists have left the island. 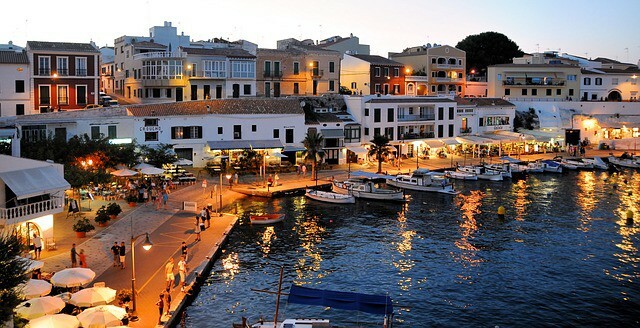 Menorca goes back to its old self of being a quaint old town with its laid-back charm. The winter can be cold, wet, and windy. Life literally shuts down October onwards until February. The streets look deserted and most restaurants would shut early. There are a lot of low-cost airlines that fly to Menorca from Barcelona and Madrid in Spain like Vueling. Also, there is Ryanair which ferries people from the UK to Menorca. There are flight sale days and if you catch one such offer in the nick of time, you can travel from Barcelona, for example for as cheap at €5! I have done it so you must believe it! Traveling by ferry is quite common for the Spanish if they have a lot of luggage or if there are moving houses. If you would like to cross the Mediterranean Sea on a ferry which slowly drifts from Barcelona at its own pace to reach Menorca, then the ferry is for you. You can book your ferry ticket here on Direct Ferries. Price of the tickets start from €40 and go up to €100. You have unending views of the turquoise blue Mediterranean waters and if you are lucky you can spot some dolphins. The night sky is star-studded when the sun goes down. Apparently, the Port of Mahón with the cathedral on top of the cliff looks stunning as the ferry slowly enters the port to dock. If you are a slow traveler looking for some artistic inspiration, then you must take the ferry at least one-way. There are a lot of things to do in Menorca like hiking, cycling, sailing, kayaking, paddleboarding, snorkeling, and more. 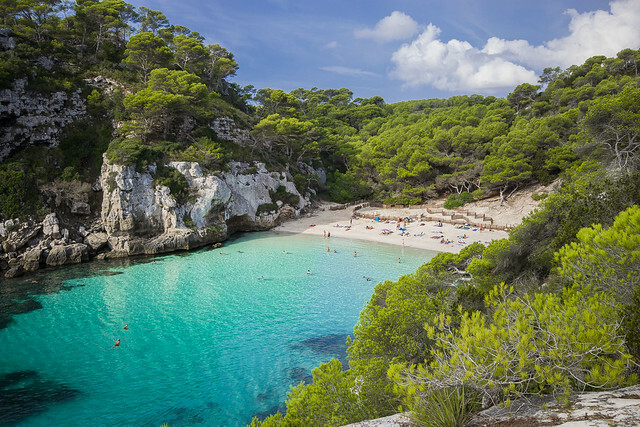 Menorca is less crowded than the other popular Balearic islands like Mallorca or Ibiza. The nightlife if thriving in the port area of Maó and the hidden bars in the maze-like streets of Ciutadella. Mahón is on the easternmost side of the island. This city has a large port which is a natural one and there are a lot of ships which come here to dock with the island’s supply. Mahón sees more economic activity than Ciutadella and the only airport that connects the island to the rest of the world is in Mahón. 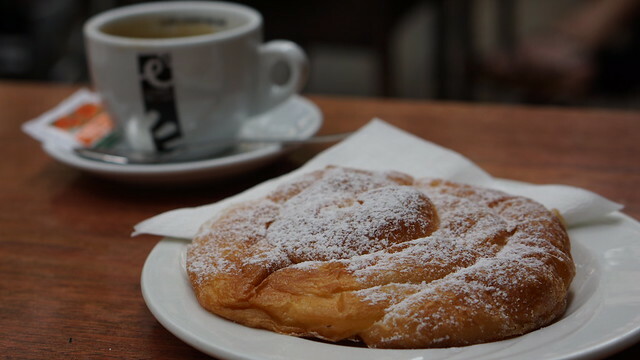 There are a lot of interesting cafes, restaurants, and bars along the port of Mahón. Try the food on this island and you can feel how the chef paid special attention to your platter. Seems like the food wasn’t mass cooked at all. Menorca’s pride is its beaches. There are a lot of sugar white beaches with pine trees growing among the rocks and crystal clear water of the Mediterranean. 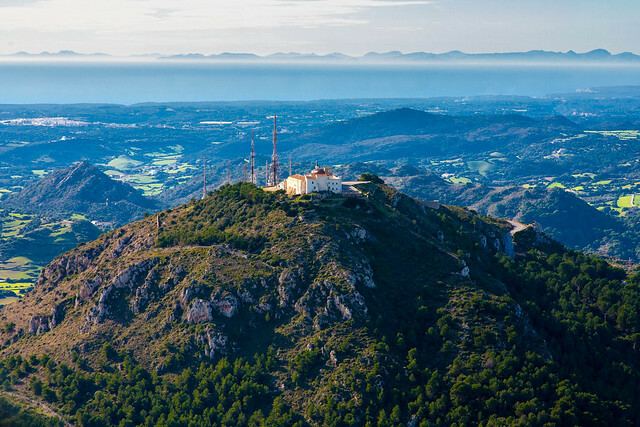 If you love being adventurous, then I strongly suggest going on the Camí de Cavalls 360º hike. This is a one of a kind hike done either on a bicycle, by foot or on a horse, the choice is yours. You will hike past every beach and cove on the island by covering the entire perimeter of the island measuring 190 km. Hence the name Camí de Cavalls 360º. There are more than 50 beaches on this island. You can cover as many beaches as you want per day in this hike. You can check out their website for more details. Also, do not be surprised if you find someone arising out of natural caves carved out of the cliffs. There are few people who actually live without material possessions on this island. Apart from Camí de Cavalls 360º, you can drive to any of the beaches here. During peak summer, there are buses deployed by the government which plies tourists to and fro to these beaches. 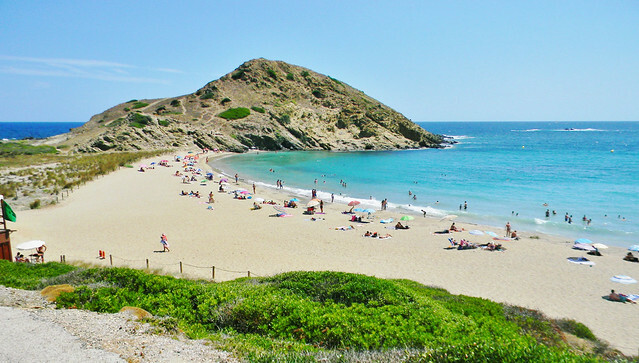 Other prominent beaches are Cala Galdana, Cala Mitjaneta, Plata de Cavalleria, Son Saura among others. This natural reserve in the north-east of the island near the village called Es Grau. This natural park is an embodiment of paradise as there are diverse habitats all within it. 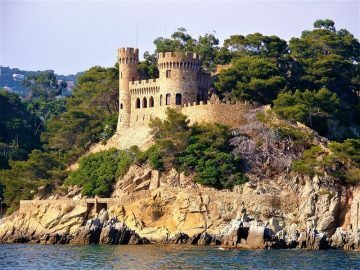 There are wetlands, marine area, cliffs, coves, beaches, and numerous islets. This park is perfect for a good hike. There are dedicated routes for enthusiastic hikers. Find more information about the place here. Part of S’Albufera National Park is an islet called the Colom Island. You can rent a kayak and go to this island, explore caves and swim in pristine waters. Find out more about this activity here. One of the things do to in Menorca like the locals is a visit to El Toro. It is the highest point on the island. El Toro is a favorite picnic spot for the locals and the for school picnics. There is a restaurant over there which provides panoramic views of the island. This is the northernmost point of the island where there is a towering lighthouse overlooking the sea. If you want the best views of a sunrise or a sunset, head to Cape Cavalleria Lighthouse. The cliff just behind the lighthouse is a great place to sit and watch the spectacular sights. You can see a lone yacht drifting in the sea sometimes and a huge cruise ship somewhere on the horizon. This fort was initially built by the British who were ruling this land during the 18th century. But when Menorca was handed over to the Spanish, the Spanish speculated that there could be a threat to Menorca from them. Hence, the Spanish built a stronger fort in its place that we see today. These are remains of settlers from the Talayotic era. These stone constructions have open meeting areas and private dwellings are also found. For information about this place, visit this website. This is another important city in Mahon. You have to visit Ciutadella in your list of things to do in Menorca. A very laid back city on the western coast. On a clear sunny day, you can see the coast of Mallorca on the other side of the sea. 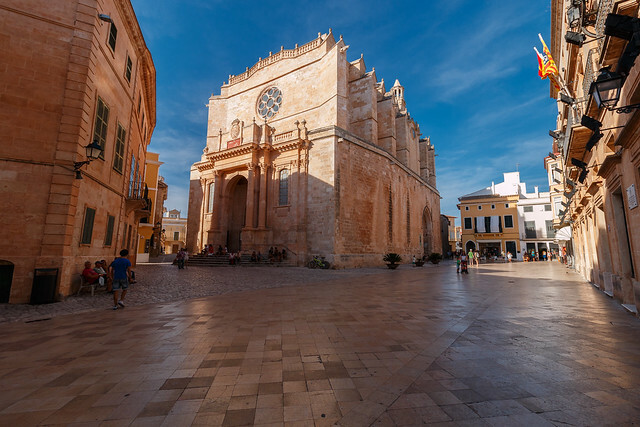 While you are here you can visit the Ciutadella de Menorca Cathedral. This is a megalithic chamber tomb dating back many centuries ago around 2000 – 1000 BC. Situated 3 miles away from the city of Ciutadella, this place is an example of this island’s history. This place was primarily used for funeral purposes. The tomb was excavated in the 1950s and the remains of at least 100 graves with the person’s belongings like bronze bracelets, bone buttons, and pottery were found. Menorca is not just nature and adventure. Menorcans have a happening nightlife where the bars are open until the wee hours of the next day. There are a lot of bars in the city center and the port area of Mahón and Ciutadella. 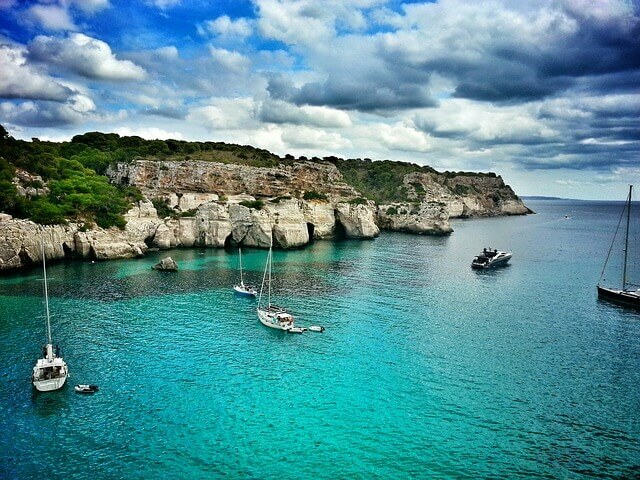 The two hangout places that I mention here should be on your list of things to do in Menorca. The experience in these places are unique and it is the most authentic way to do what the locals do here. 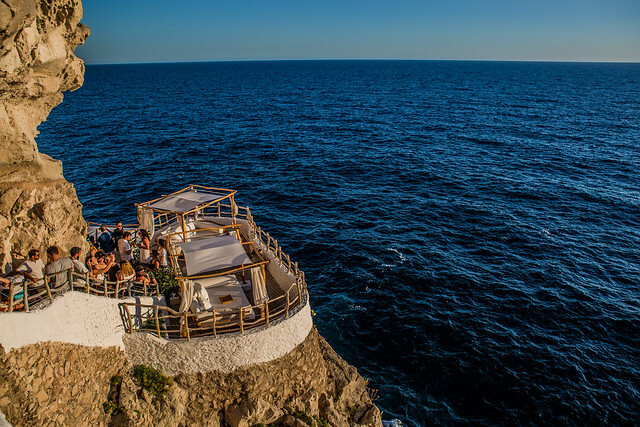 This club which is set in a place carved out of rock in a cliff. You can see spectacular sunsets while you sip on fine cocktails. There is a dance floor here but don’t think this place is just for youngsters to hang out. Families with their little kids throng this place for the views. You can read more about it here. A bar carved out of a limestone cliff, right next to the port area is the place to be if you want to listen to traditional music being sung live. Though the songs are mostly in Catalan and Spanish, the passion with which the artists sing warms your heart. The place gets very crowded with music enthusiasts every night. This is the best place to relax, sip on a fine cocktail and immerse yourself in the Menorcan way of life. Ignore the nightclub for once to be here! Try the desserts in Menorca. They seem to have a sweet tooth and the sweet dishes here are otherworldly. These sweet treats are something that you can carry in your flight back. They are ensaimadas and crespells. Banyas is a flaky pastry rich in cream. Try this after a light meal for lunch or dinner. What to shop in Menorca? Buy yourself a bottle of pomada before you leave Menorca. This is a prized possession that you can take home and share with family and friends. It is Menorcan gin with lemonade and should be taken with lots of ice. Last but not the least, buy yourself a pair of avarcas or Menorquinas. These are footwear traditionally worn by the farmers while they are toiling in the fields. These are made of cow leather which is ethically sourced. The soles of the avarcas are made of old car tires. These are ethical and environmentally friendly as old rubber tires are recycled. A nice pair of avarcas definitely will add to your style quotient. They are both for men and women. They last for a really long time. The pair I bought 3 years ago is still going strong. We have shared all the information needed to have a great time on this island. Follow this list of things to do in Menorca and let us know of your experiences.